There is a big difference between the flooring needs of regular commercial building and industrial premises such as airport hangars, laboratories or warehouses. Industrial flooring must be able to cope with heavy-duty machinery, chemical substances and intensive usage without succumbing to corrosion or cracking. It’s crucial to look at the specific business needs to ensure that the correct type of industrial flooring is selected. 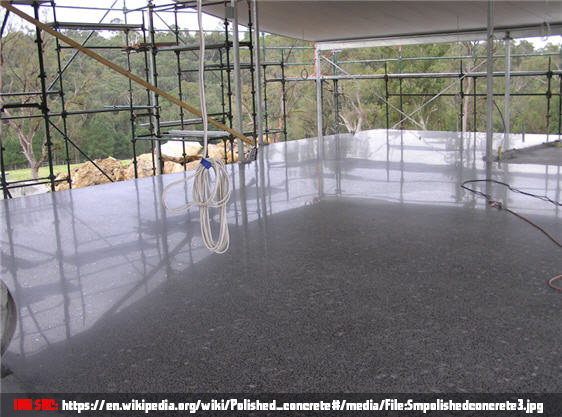 Typically, industrial floors consist of several layers with multiple purposes, so that a hardwearing surface is created that will withstand the industrial workload placed upon it over a long period of time. Layers can include moisture barriers, sub-grade layers and load-bearing layers, making them much stronger and therefore better equipped to deal with the demands of the heavy usage. The type of industrial flooring chosen will be determined by the strain that will be place on the surface by your business operation on a daily basis. 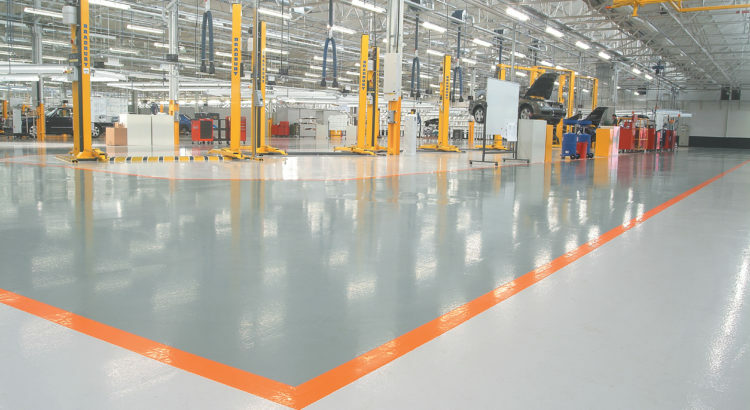 If you think of flooring for commercial buildings such as automotive and aerospace industries, food & drink production or healthcare facilities, you will want to choose an epoxy resin coating. This type of flooring is durable and easy to clean, making it the ideal choice for coping with slippages and chemical spillages that are likely to occur in this sort of environment. Epoxy Resin Flooring can be made more decorative with added flakes or aggregates, making it the ideal flooring system for the commercial industry. Will your flooring cope with heavy usage demands? For more robust flooring, for instance for breweries, laboratories and large chemical plants where there is regular contact with concentrated chemicals, a polyurethane resin flooring system may be more appropriate. Resin flooring screeds are fully capable of withstanding with steam and the intense heat often associated with this type of plant. Resin flooring is hard wearing, non-porous and impervious, with high quality abrasion resistant properties. Polyurethane resin flooring give outstanding resistance to chemical substances and physical damage – essential for health & safety in and around hazardous equipment and machinery. 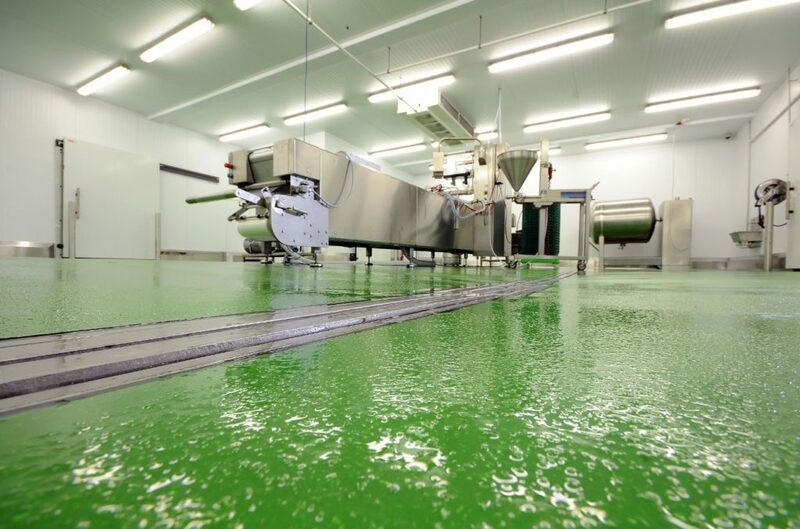 Hygienic flooring systems are essential in the food processing and handling industry, and healthcare and pharmaceutical sectors, where health & safety take priority. With wet food processing, flooring must be sanitised, cleaned and finished to a high standard, as well as maintain resistant to a range of chemical substances and slip hazards. Whether your industrial flooring requirement is for heavy duty polyurethane screeds, anti-slip epoxy paint coatings or decorative epoxy screeds, pumped polymer or levelling screeds, it is essential to partner with an experienced contractor. The right contractor will be able to provide you with full written specifications, detailed production and cost sheets and full method statements. They will also be able to offer you an on-site survey service, and invite you to take a site visit to previous installations. In short, they will make sure that you receive all the technical advice you need to make the right industrial flooring product choice, while demonstrating their professional installation capabilities. Article provided by Mike James, working together with South East England based specialists Resin Flooring Ltd; one of the market leaders in repairing and refurbishing industrial resin flooring systems, installing industry-leading products such as Resdev, Altro, Ardex and Remmers. 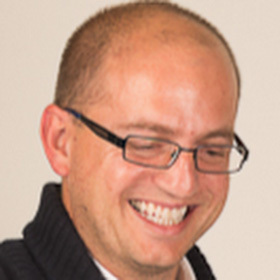 Mike James is an independent content writer working alongside a small number of companies in the property industry across Sussex. With over 15 years writing experience, Mike combines his passion for property with a love of journalism to provide a positive reading experience where represented companies are concerned.